COTTER, Ark. – Arkansas’s trout tailwaters are famous for incredible scenery, fast action and some of the biggest brown trout in the world – just ask Kansas angler Calvin Johnston. Johnston, a resident of Olathe, Kansas, was enjoying his first trout-fishing trip to The Natural State Friday, February 27, when he hooked into a fish that will have people up and down the White River talking for years. Johnston grew up in Little Rock and graduated J.A. Fair High School before moving to Kansas. He says his brother and brother’s friends from the Bryant Police Department always go to Rainbow Drive Resort on the White River for a trout trip during this time of year. This year he decided to join them to see what the trout fishing was like. When the group arrived, the current was flowing too heavily to wade more than a few feet from shore, and the cold weather had most of the party taking a break to warm up Friday afternoon. Johnston says nearly all the line peeled off the reel on the fish’s first run. After a few tries, the pair finally managed to get the trout’s head in the net and pull her to shore. AGFC Trout Management Program Coordinator Christy Graham and District Fisheries Biologist Jeremy Risley met Johnston to weigh the fish on certified scales at the Mountain Home Field Office. “It’s official weight and length was 38 pounds, 7 ounces, and it was 36.6 inches long,” Graham said. 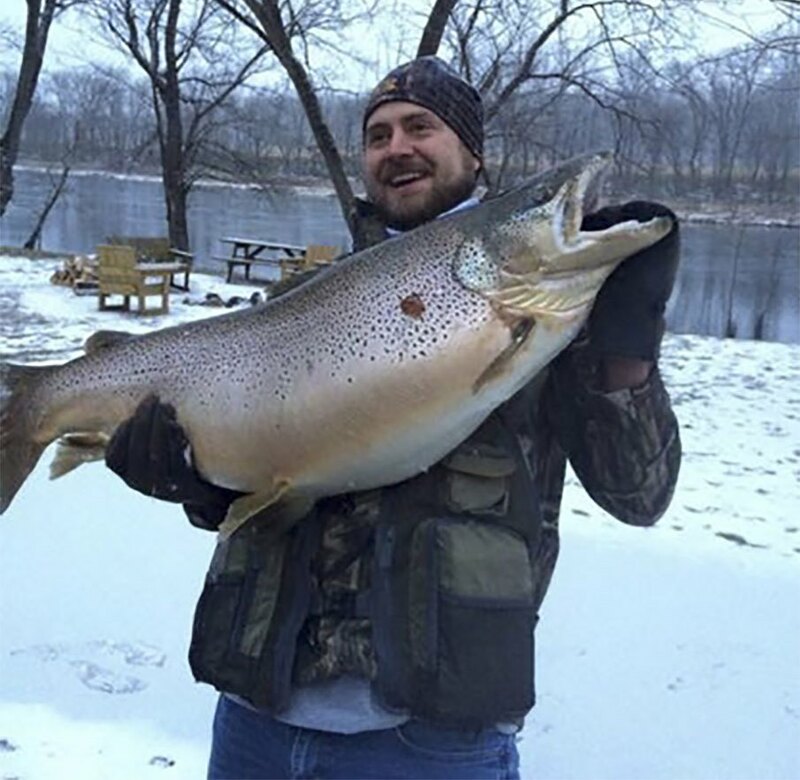 “I’ve looked into former records for brown trout in Arkansas, and can only find official records of two brown trout being larger –Rip Collins’ former world-record from the Little Red River that weighed 40 pounds, 4 ounces and the previous world-record fish from the Norfork Tailwater that weighed 38 pounds, 9 ounces.